Manhattan medium Thomas John has been hailed as “the Hollywood psychic with the highest batting average” by The Hollywood Reporter, and as a psychic medium with “an impressive connection that impresses even the most skeptical minds” by TheExaminer.com. Now he shares what he’s seen and heard on the Other Side. 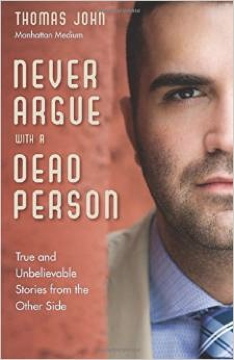 In this book, John shares with us fifteen fascinating stories of what happens when clients ask him to contact their dead friends and relatives. Included here are the story of a 30-something New Yorker who was unable to stop fantasizing about suicide until he conveys healing words from her dead fiancé; an account of an encounter with a grieving young woman in a drugstore–and the message he conveys from her dead six-year-old son; and a disturbing story of an unsolved murder case solved by information he received from the other side. Above all, this is a book filled with comfort, love, forgiveness, and hope. For Thomas John, death is not the end, it is just the beginning. Our friends and relatives are still with us. They care for us. They watch over us. And, in times of particular need, they offer us their help.